Request a free, no-obligation quotation. f) Where agreed before hand and extra charge, chases to walls, etc will be re-filled to 2mm below plaster finish depth, however final finishing of skim coat plaster and final decoration is excluded. g) All endeavours will be made to undertake installation work to a clean standard, using dustsheets and vacuum cleaning equipment as necessary. However, dust is inevitable. Where agreed before hand and at extra charge, we can provide a cleaning service. h) The contract / quote outlines the expected duration of the installation work. i) Whilst undertaking the installation work at the property, the client is required to provide water and power free of charge. j) For property rewires the property must not be inhabited without prior agreement. d) Removal from site and disposal of rubble, fittings, wiring, materials, general waste and packaging is not included. However, this can be provided at extra cost. b) the customer continues to grant and facilitate the agreed and necessary access to the premises being worked on if the originally stipulated duration of the contracted works is to remain valid. Unless stated otherwise, the standard working hours between the hours of 09:00 hrs - 17:00 hrs Monday to Friday inclusive. Access may be required outside these hours to complete works on time as set out in the contract thus access may be required from 08:00 hrs - 20:00 hrs. c) Any additional work not covered in our quoted costs will attract additional time charge rate of £35.00 per hour plus materials cost. d) All figures quoted for materials are subject to VAT at the prevailing rate. f) You have a cooling off period of 7 days from accepting a quote from us or the length of time to the commencement of works if less than 7 days. Greater than 7 days could lead to a cancellation fee. a) All work where applicable, will be executed fully in compliance with applicable Building Regulations and BS7671 in force at the time of the work, particularly in respect of work in dwellings to allow the legal Part P obligations to be met. Where a deviation from such regulations, a written instruction and record will be required. b) All goods supplied shall remain the property of Stefano's Electrical Services until all sums due have been paid in full. a) Stefano's Electrical Services warrants its installation work to be defect free for a period of twelve months from invoice date. Such cover does not extend to goods not supplied by Stefano's Electrical Services, physical damage to products, or any instance where the original installation has been altered or tampered with subsequently by third parties. a) Unless agreed in writing payment in full must be made on completion of the specified works to Stefano's Electrical Services. b) Stage payments will be requested by prior arrangement where planned works take longer than 21 days or are over £3500. We reserve the right to request from you stage payments in the instance where works take longer than 21 days. b) Payment for full contract amount to be paid within 5 working days of completion regardless of any unresolved disputes, otherwise subject to 8%APR until paid in full. c) Where we use sub-contractors to complete tasks out of our description (Joinery & Electrical) we do so in good faith. However, any problems that require a resolution will need to be done so with them directly. We do not guarantee the work of others. d) In the unlikely event of a complaint, any remedial works will be undertaken by Stefano's Electrical Services employees or selected sub contractors. We do not pay for others to complete such tasks. a) We reserve the right to take photographs and video of completed works for our records and for use in our portfolio unless requested in writing prior to commencement not to. For a FREE, no-obligation quote - call us on 01507 327 737 or email Stefano. 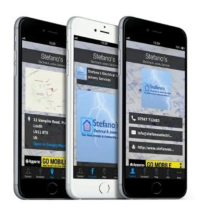 Download our new mobile phone app. If you’re looking for an electrician, kitchen fitter or joiner in Louth - you’ve come to the right place. Please get in touch. 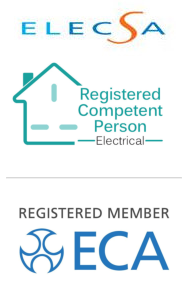 If you’re looking for an electrician, kitchen fitter or joiner in Mablethorpe - you’ve come to the right place. Please get in touch. If you’re looking for an electrician, kitchen fitter or joiner in Grimsby - you’ve come to the right place. Please get in touch. We've been servicing Alford and the surrounding area for many years. If you’re looking for an electrician, kitchen fitter or joiner in Alford - you’ve come to the right place. Please get in touch. If you’re looking for an electrician, kitchen fitter or joiner in Horncastle - you’ve come to the right place. Please get in touch.